Eid Al-Adha Goats Cost More This Year Because Of Pakistan's Harsh Droughts : Goats and Soda Buying a sacrificial goat for the Muslim holiday of Eid l-Adha is the sign of a strong household. But harsh droughts in the Karachi area are making it hard for families to afford one. Goats at a market in Karachi, Pakistan, are decorated ahead of Eid al-Adha celebrations. Thursday marks the start of Eid al-Adha, the holiest Muslim day of the year. It celebrates the biblical story of Abraham and his willingness to sacrifice his son for God. The moment before the sacrifice, God intervened and sent a goat to take the boy's place. Muslims around the world celebrate the holiday by sacrificing a goat, then eating it together with family and friends. But for many Muslims in Karachi, Pakistan, that tradition will be harder to follow this year. Providing enough goats for a city of 15 million, like Karachi, is quite an undertaking. The city hosts an annual goat market where herders bring hundreds of thousands of goats, adorned with handmade collars and bangles, to sell in the days leading up to the holiday. This year has been especially tough for the goat herders at the market. Pakistan's southern provinces have been experiencing some of the harshest droughts in recent history. According to ACAPS, a Geneva-based crisis research organization, below-average rainfall in 2016 resulted in substantial loss of crop production, including the type of grass that goats in the region eat in Sindh, the southern province where Karachi is situated. As a result, the price of that crop has increased, forcing herders to pay a lot more for goat feed than usual. And so the cost of the goats has skyrocketed. Ghulam Siddique, a herder from Khairpur in Sindh, has yet to sell a single goat at the market with this year's prices. "[Goat herders] need to increase the cost of our goats because the cost for animal feed is increasing with the water shortages," says Siddique. 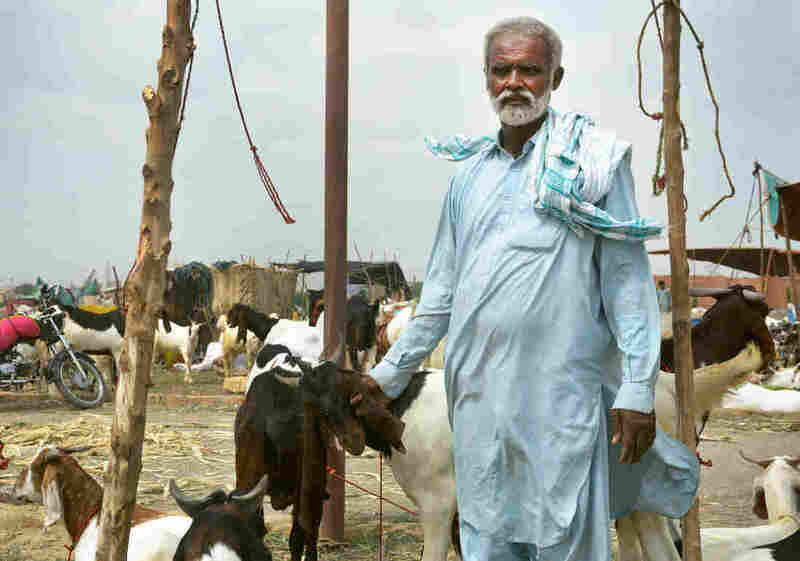 Ghulam Siddique, a goat herder from Pakistan's Sindh province, has been forced to increase the price of his goats to offset the rising cost of the animals' feed. 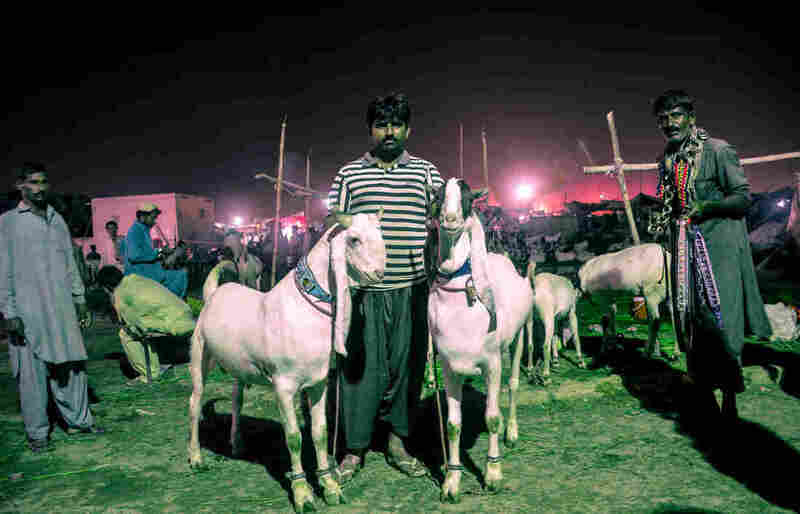 For Kamran Ahmed, a low-income laborer from North Karachi, the increased livestock prices mean his family might not purchase a goat this year. A single animal usually goes for $200 to $300 at the market — a sizable portion of his monthly income. "The prices are up by as much as [about $47] this year," he laments as his son roams the goat market grounds, playing with the ribbons and pompoms hanging on the goats. "I'm not making a higher salary than last year. If this is how much [the herders] are charging, we may decide not to purchase." Other window shoppers at the goat market also felt a sacrificial goat will be out of their budget. 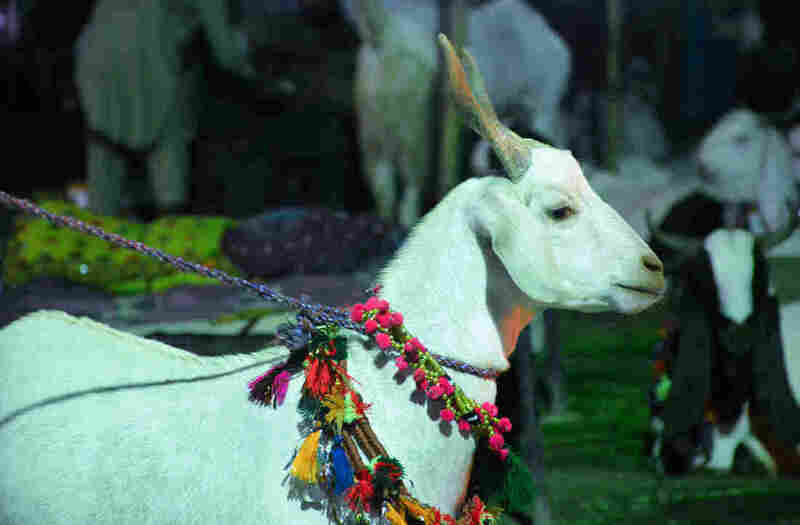 Naeem Furan and his wife, Sajda, had been looking for a well-priced goat for the holiday, a tradition that the couple, both in their late 30s, have maintained since they married. "If we can't find [a goat in our price range] we'll end up linking with another family in their sacrifice. But it's the mark of a strong household," Furan said of the practice. "God willing, we'll find one we can afford and do the sacrifice ourselves." Karachi hosts an annual market where herders bring hundreds of thousands of goats to sell in the days leading up to Eid al-Adha. When people don't buy, herders like Siddique face an uncertain future. "I rent my home in Khairpur," he says. "If I don't make a profit from these goats, I won't make rent and my landlord will kick out my family." "We won't have a home to come back to," he says, as he fiddled with some of the goat feed. Meher Ahmad is a journalist and documentary producer based in Karachi, Pakistan. Follow her on Twitter at @_meher.